In the past few decades, scientists of human nature—including experimental and cognitive psychologists, neuroscientists, evolutionary theorists, and behavioral economists—have explored the way we arrive at moral judgments. They have called into question commonplaces about character and offered troubling explanations for various moral intuitions. Research like this may help explain what, in fact, we do and feel. But can it tell us what we ought to do or feel? 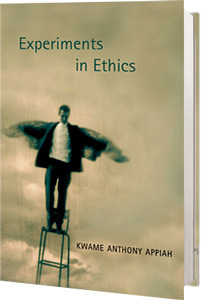 In Experiments in Ethics, the philosopher Kwame Anthony Appiah explores how the new empirical moral psychology relates to the age-old project of philosophical ethics. See the Audible.com audio book. Race, ethnicity, nationality, religion, gender, sexuality: in the past couple of decades, a great deal of attention has been paid to such collective identities. They clamor for recognition and respect, sometimes at the expense of other things we value. But to what extent do “identities” constrain our freedom, our ability to make an individual life, and to what extent do they enable our individuality? In this beautifully written work, renowned philosopher and African Studies scholar Kwame Anthony Appiah draws on thinkers through the ages and across the globe to explore such questions. The Ethics of Identity takes seriously both the claims of individuality–the task of making a life—and the claims of identity, these large and often abstract social categories through which we define ourselves. What sort of life one should lead is a subject that has preoccupied moral and political thinkers from Aristotle to Mill. 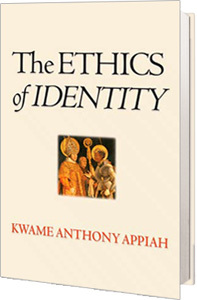 Here, Appiah develops an account of ethics, in just this venerable sense–but an account that connects moral obligations with collective allegiances, our individuality with our identities. As he observes, the question who we are has always been linked to the question what we are. Adopting a broadly interdisciplinary perspective, Appiah takes aim at the clichés and received ideas amid which talk of identity so often founders. Is “culture” a good? For that matter, does the concept of culture really explain anything? Is diversity of value in itself? Are moral obligations the only kind there are? Has the rhetoric of “human rights” been overstretched? In the end, Appiah’s arguments make it harder to think of the world as divided between the West and the Rest; between locals and cosmopolitans; between Us and Them. The result is a new vision of liberal humanism–one that can accommodate the vagaries and variety that make us human. 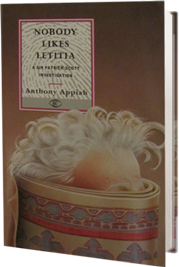 Ideal for introductory philosophy courses, Thinking It Through is organized around eight central topics–mind, knowledge, language, science, morality, politics, law, and metaphysics. 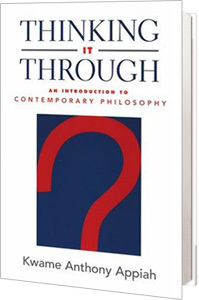 It traces how philosophers in the past have considered each subject (how Hobbes, Wittgenstein, and Frege, for example, approached the problem of language) and then explores some of the major questions that still engage philosophers today. More importantly, Appiah not only explains what philosophers have thought but how they think, giving students examples that they can use in their own attempts to navigate the complex issues confronting any reflective person in the twenty-first century. Filled with concrete examples of how philosophers work, Thinking it Through guides students through the process of philosophical reflection and enlarges their understanding of the central questions of human life. In America today, the problem of achieving racial justice–whether through “color-blind” policies or through affirmative action–provokes more noisy name-calling than fruitful deliberation. 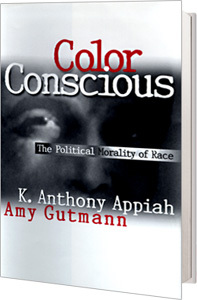 In Color Conscious, K. Anthony Appiah and Amy Gutmann, two eminent moral and political philosophers, seek to clear the ground for a discussion of the place of race in politics and in our moral lives. Provocative and insightful, their essays tackle different aspects of the question of racial justice; together they provide a compelling response to our nation’s most vexing problem. 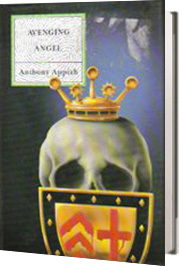 Appiah begins by establishing the problematic nature of the idea of race. He draws on the scholarly consensus that “race” has no legitimate biological basis, exploring the history of its invention as a social category and showing how the concept has been used to explain differences among groups of people by mistakenly attributing various “essences” to them. Appiah argues that, while people of color may still need to gather together, in the face of racism, under the banner of race, they need also to balance carefully the calls of race against the many other dimensions of individual identity; and he suggests, finally, what this might mean for our political life. Gutmann examines alternative political responses to racial injustice. She argues that American politics cannot be fair to all citizens by being color blind because American society is not color blind. Fairness, not color blindness, is a fundamental principle of justice. Whether policies should be color-conscious, class conscious, or both in particular situations, depends on an open-minded assessment of their fairness. Exploring timely issues of university admissions, corporate hiring, and political representation, Gutmann develops a moral perspective that supports a commitment to constitutional democracy. Appiah and Gutmann write candidly and carefully, presenting many-faceted interpretations of a host of controversial issues. Rather than supplying simple answers to complex questions, they offer to citizens of every color principled starting points for the ongoing national discussions about race. The beating of Rodney King and the resulting riots in South Central Los Angeles. The violent clash between Hasidim and African-Americans in Crown Heights. The boats of Haitian refugees being turned away from the Land of Opportunity. These are among the many racially-charged images that have burst across our television screens in the last year alone, images that show that for all our complacent beliefs in a melting-pot society, race is as much of a problem as ever in America. In this vastly important, widely-acclaimed volume, Kwame Anthony Appiah explores, in his words, “the possibilities and pitfalls of an African identity in the late twentieth century.” In the process he sheds new light on what it means to be an African-American, on the many preconceptions that have muddled discussions of race, Africa, and Afrocentrism since the end of the nineteenth century, and, in the end, to move beyond the idea of race. 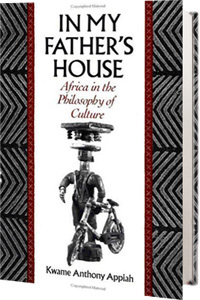 In My Father’s House is especially wide-ranging, covering everything from Pan Africanism, to the works of early African-American intellectuals such as Alexander Crummell and W.E.B. Du Bois, to the ways in which African identity influences African literature. In his discussion of the latter subject, Appiah demonstrates how attempts to construct a uniquely African literature have ignored not only the inescapable influences that centuries of contact with the West have imposed, but also the multicultural nature of Africa itself. Emphasizing this last point is Appiah’s eloquent title essay which offers a fitting finale to the volume. In a moving first-person account of his father’s death and funeral in Ghana, Appiah offers a brilliant metaphor for the tension between Africa’s aspirations to modernity and its desire to draw on its ancient cultural roots. During the Los Angeles riots, Rodney King appeared on television to make his now famous plea: “People, can we all get along?” In this beautiful, elegantly written volume, Appiah steers us along a path toward answering a question of the utmost importance to us all. Should the notion of truth play the central role in theories of meaning after all? Could it be that the persuasive arguments of the anti-realists are actually based on misunderstandings of verificationism? 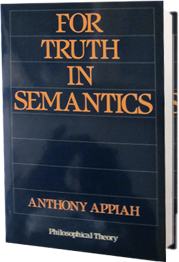 The author argues that anti-realism fails in its attack on truth-based semantic theories and that many of its positive claims are in fact false. No defensible semantic theory can be based on conditions of assertibility, because the contents of assertions are underdetermined by the evidence that warrants them. The central arguments of anti-realism against truth-based semantic theories are clearly expressed and examined, the ambiguities involved in “verifiability” are discussed and an independently plausible realist theory is put forward. This fresh approach gives a new development in the debate between realism and anti-realism which will open up new aspects of the subject. This book develops in detail the simple idea that assertion is the expression of belief. In doing so, it promises to challenge a number of widespread and entrenched views about the relations of language and mind. The author holds, contra Michael Dummett and Donald Davidson, that we can give an account of the contents of beliefs, independent on any accounts of language, and then go on to explain linguistic acts as the expression of those beliefs. Accordingly, he begins in Part I by presenting a theory of belief, in terms of the functional role of beliefs. The account is developed through a version of decision theory, modified to recognize ways in which agents can fail to be rational. 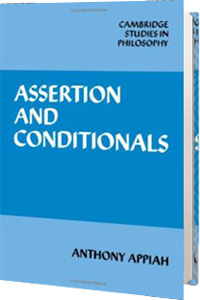 From this, in Part II, Appiah generates a theory of meaning in terms of “assertibility conditions,” whereby to know the meaning of an assertion is to know the belief it expresses. Finally, in Part II, he shows how this theory can solve long-standing problems in the semantics of indicative conditional sentences. In its technical detail, the theory constitutes a refinement of “probabilistic semantics.” It improves on previous views by taking account of the fact that we are not always perfectly rational. However, it also offers a significant advance in generality on theories of meaning couched in terms of truth conditions, because it builds in the fact that not all sentences express a high degree of belief that something is true. American Book Exchange (ABE Books) and Alibris are websites that match used and rare book cstomers wth dealers and suppliers around the world. They often have copies of my novels, as does Amazon. So check all of them to find the best price. A series of murders at Cambridge University: and who better to solve them than Sir Patrick Scott, honorary fellow of Clare College, brilliant lawyer, and cousin of David, Viscount Glen Tannock, the first victim? Patrick Scott and his wife Virginia are guests for the New Year on the island of Sealsay, off the west coast of Scotland. When their host’s strange sister, Letitia, is seen leaping from the cliff tops to the raging seas below, everyone assumes at first that she has killed herself. But then her body is found, not damp on the beach but stabbed in the house; and Patrick must try to find out what has happened. Patrick Scott and his wife Virginia are in Venice to celebrate their fortieth anniversary, staying with his school-friend Bernadetto di Montebello in his family palazzo on the Grand Canal. 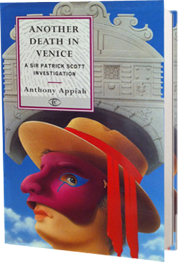 When the body of a young Australian they have just met on the Orient Express turns up floating in a Ventian canal, this is only the first of a surprising string of murders, that will lead Sir Patrick to an international conspiracy that connects two girls in Bolivia to an English lord and a young Asutralian friend of the first victim.